I know it is a great morning when I have breakfast waiting for me in the fridge. I didn't even have to jump out of bed this morning and get my daughter off to school. Nope, all I had to do was heat my breakfast up, pour myself a cup of tea and crawl back into bed. Yep, it's gonna be that kind of day, easy street all the way. Not only did I make breakfast in advance but I am sharing it with all of you over at the lovely Mangiabella. You are gonna want to hurry up and make yourself a batch of this Bruleed Steel-Cut Oatmeal with Apple Compote so you can get back in bed and spend the day under the covers ignoring the world. I know I will be here as long as humanly possible or at least till I can't stand the lunch hunger pangs anymore. Hope you all have a lovely carefree day today! Thanks Marta, I have to say I rather enjoyed it. I eat oatmeal every morning, but have never even thought of Bruleed oatmeal I must try it. I usually just add half of an apple, chopped with cinnamon. I can't wait to try it. Great tip to cook the oatmeal the night before:) Thanks,Gina! love love love your post...love it. We love oatmeal too! This is such a wonderful and satisfying breakfast. Have a great day, Gina. This looks and sounds so yummy! I've been looking for ways to jazz up my oatmeal, so thanks for sharing this! I love easy street days! Super looking oatmeal -- on my way to check it out right now . . .
What a cozy breakfast, I love the bruleed top and that delicious apple compote! I'm not a big oatmeal eater (except in cookies! ), but bruleed with apples sounds pretty incredible!!! Yum! 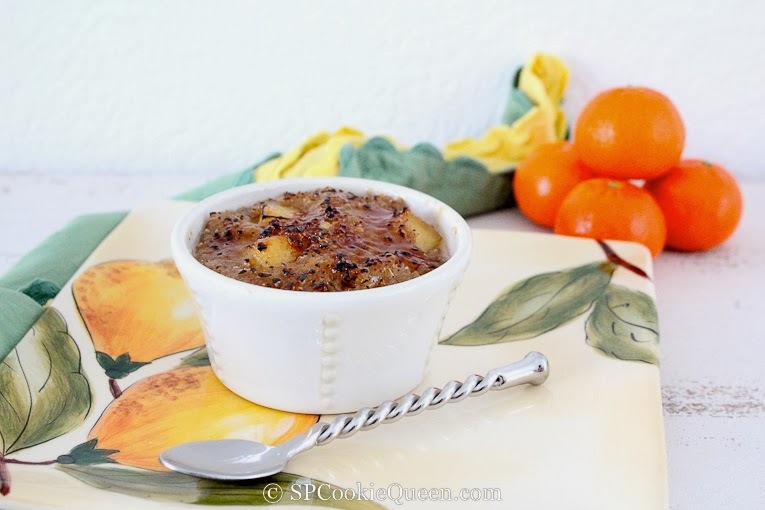 I love the brulee..it is almost like having a dessert for breakfast...what not to like? Hi Gina! I saw this recipe over at our dear friend's site. Looked lovely there and looks lovely here too!